Matsuri raises Takeshi’s sword to stab Aono, but Aono pushes Yorito off of her and manages to only get hit in the shoulder. Continue Reading "sola – 13 (END)"
Sometime in the past, Matsuri had learned of Yorito and Aono’s plans to leave the cave where they were staying, and she had assumed that they were going by themselves. Continue Reading "sola – 12"
As he pulls off the pictures of the blue sky from his ceiling, Yorito remembers how he had told Matsuri about wanting to turn everything back with his sister. Continue Reading "sola – 11"
Yorito returns with Mana to the deserted house where he stabbed Matsuri, but he’s still not sure why he did it and decides that he has to find her. Continue Reading "sola – 10"
Declaring that Matsuri isn’t here anymore and saying goodbye, Aono sharpens her origami paper and attacks. Continue Reading "sola – 09"
Yorito sees Matsuri lying on the ground bleeding after he stabbed her, but the next thing he knows, it’s daytime and he’s sitting in class. Continue Reading "sola – 08"
It has been a week since Matsuri disappeared, and Yorito finds himself starting at the sunrise one morning at the drink machine where they first met. Continue Reading "sola – 07"
A long time ago, Yorito had arrived at a cave after struggled to climb a hill in direct sunlight while wearing a hood. Continue Reading "sola – 06"
As I’m sure many of you have already heard, the big news for today is that Da Capo II is getting an anime. In an interview published in the June edition of Comptiq (the same magazine that Lucky Star is serialized in and pimps every week), producer tororo stated among other things that he wanted the anime to be as long as possible. There’s no set air-date yet, and I haven’t paid much attention to the game since it came out about a year ago, but I’m interested in seeing how this turns out. In other upcoming anime news, Kamen no Maid Guy is also getting an anime, but I suspect that most people aren’t familiar with this series. I was first introduced to the manga almost two years ago when Dom wrote about it over at MegaTokyo. To use his description, it’s “the heartwarming story of a maid-loving rich old man, his almost-of-age granddaughter Naeka, and the musclebound, shark-toothed, mask-wearing freak of a maid he assigns to protect her until her 18th birthday.” It’s very fun to read, and I hope it translates well into anime form. For those of you who are watching sola, it was announced on the official production blog that the show is going to be 15 episodes total, two of which will be DVD-exclusive. The one that is to be included with DVD 4 (on sale September 25th) is going to be “packed with the charms of the characters of sola,” but they are keeping secret about the one to be included with the final DVD 5 (on sale October 26th). In seiyuu news, it seems that popular voice actress Horie Yui will be appearing on HEY!HEY!HEY! MUSIC CHAMP soon. Her appearance is being filmed this Thursday, so it might air next Monday. I mention this mainly because many of you may remember how Hirano Aya generated a lot of buzz last year from appearing on the same show. 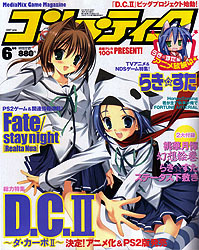 Continue Reading "Random Musings – Da Capo II Anime And Other News"
Many years ago, a boy had arrived home to find a girl who resembled Mayuko lying in a pool of her own blood. Continue Reading "sola – 05"
When her classmates come to visit her at the hospital, Koyori tells them that she’s not lonely because her sister always comes to visit and because she has someone to play with here. Continue Reading "sola – 04"
With Matsuri getting settled down in his home, Yorito is ready to go to school again, but he panics when Mana drops by to pick him up. Continue Reading "sola – 03"
While the man with the sword is occupied with Yorito’s sudden intrusion into the church, Matsuri grabs a candelabra and rushes toward the entrance. Continue Reading "sola – 02"
Early one morning, Morimiya Yorito leaves home and bikes to the waterfront so that he can take pictures of the first light of day. Continue Reading "sola – 01"